I knew the moment I saw this beautiful book that I would be buying a physical copy just so that I could occasionally look at it. It has to be one of my favorite cover arts ever. But this gem of a book is not just a pretty face, The Prey of Gods exceeded every expectation that I had going in. It is a wonderfully unique, strange, and yet familiar story. Drayden managed to take a well used plot and created a story that is so different and impressive that I am still thinking about these characters days after having finished the book. I went in thinking that I would get an interesting fantasy romp featuring a little girl in South Africa with the potential for some cool powers and maybe a little AI or other advanced technology thrown in for added entertainment. What Drayden delivers is a story that is nuanced and has so much depth that I was left amazed at what she was able to do in such a short and tightly woven story. 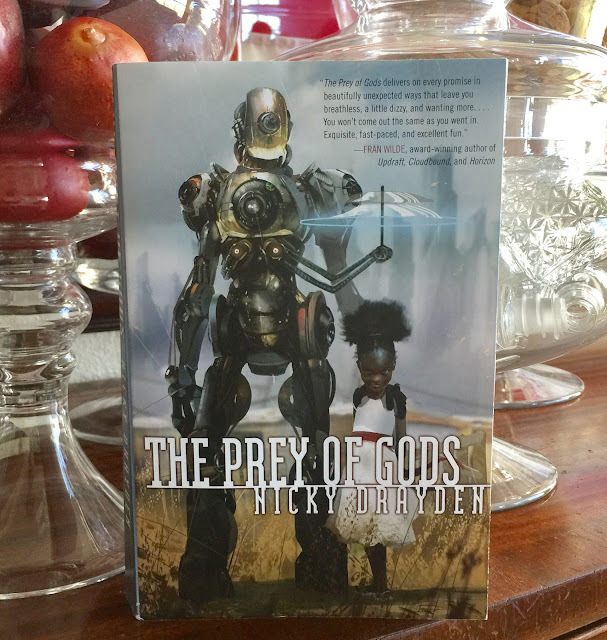 Every major character in Prey of Gods represents the struggle for love, acceptance, and a sense of belonging that everyone faces at some point in their lives. Each character is vying for those human necessities in different ways and for different reasons. Each character is searching for that sense of home that is found not in a place, but in other people who will love them despite their individual flaws and shortcomings. Drayden has created a world in which love, adoration, worship, and even fear can, for some, literally fill a hunger that can not be sated in any other way. A world where when some receive those tributes whether voluntarily given or not, the receiver becomes more powerful; and without it they can't survive. In Prey of Gods the reader not only gets to see the awakening of self awareness in people of varying ages, from a ten year old little girl to a middle aged man struggling with his own identity; but we also get to see what happens when sequences of zeros and ones turn into sentience along with the fallout of new conscious choices. I could easily do a long review describing the significance of each of these characters that begin as strangers, but whose lives eventually converge so dramatically. However, it would be hard for me not to ruin the experience for other people. Each character is so unique with so much to explore, and this is just the first book! What I will say is that The Prey of Gods is hands down my favorite book that I have read so far this year. Just writing this review makes me want to re-read it already. 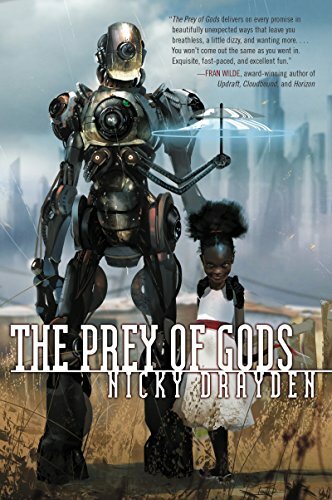 I will be anxiously waiting for the next book by Nicky Drayden. Oh. Em. Gee. This review is making me SO excited to read this book. I've got a hold request on it at my library and I cannot WAIT to get my hot little hands on it. I look forward to reading what you think about it, it gave me all kinds of joy!